The insulation factor on this bag is great, we sell it our sporting goods store as a branding item with our logo on it. I personally use it for picnics and tail-gating all the time and it works great. Great color options, very easy to place an order on line for this cooler bag. Sturdy and endless potential uses for this cooler bag. Ordered 6,000 customized it exactly how I like, recently sold out of the last 3,000. Thanks CEP! I own a retail store and my customers love the cooler tote bags! These bags are easy to customize and kept our customers drinks cold! Recently received the bags, very happy to see the quality & its fabrication. And delivery was also on time. I customized my earth-friendly cooler bags and placed my order for 5,000. The whole process was easy and stress free. We recently ordered these bags for our annual convention and they were a huge success! These bags keep our beverages cool for longer than any other bag we've tried! Thanks CEP! These bags are super durable and visually appealing. Also, our logo looks amazing on them! Our bags are wonderful! So practical and attractive. So practical and high functioning! Our food stayed hot for so long! We are so impressed! These bags work better than any other insulated bag I have ever used! We recently ordered these bags for a business conference and they kept our drinks cold all day! The most cost efficient way for us to promote ourselves and be eco-friendly. These bags have been a blessing for our company. Our customers loved getting these eco-friendly insulated cooler bags as a free give away. They were such a big hit that I'm placing another order today. These bags really live up to their billing. They are absolutely durable and water tight. Trust me I have surely put them to the test. They have passed with flying colors. Very sturdy, the handles are strong and the zipper enclosure works well, I rate this bag 5 stars. Great for grocery stores, I suggest this to all food retailers to abolish the plastic bag it is harmful to the environment and irresponsible. We do not use the plastic nor paper bags any longer at my store. We offer an assortment of recycled reusable bags from wine totes to this exact cooler bag. This is the easiest way to save the environment, use reusable bags for your grocery store. I own a family run butcher shop and we sell this bag with our logo on it. It has been a great tool for us and our customers. Our customers bring it into the store with them purchase there fresh meat and take it home. I have had to reorder this bag because they became so popular at my store. Zipper works well and the handles are sturdy. I would say 99% of the order is great bags that we will be handing out. Pretty good considering we ordered thousands. Custom earth promos is a cool eco-friendly company to use for promotional products. I love this cooler bag. I ordered large quantities of the green, blue and red bags. The prints came out great on the red and green, my intern submitted the wrong graphic logo for the blue. SOO we need to re order that color, besides that the bags looked great and we received them on time as stated by custom earth promos. Quality product, our whole order came as we expected. Awesome bag to use for BBQ's. I sell these bags at a very affordable price (because there priced well) and give the bag away when a customer makes a purchase of over 50$. All of them love the bags. Durable bag I have used it for several outings and still going strong. We were very confident using custom earth promos for our promotional cooler bags based off of previous experiences we have had with them. I work in marketing and this year we used this bag as our "gift bag" to all of our employees around the country. It was received well and everyone loved it. Perfect cooler bag, my customers purchase this bag all the time for me. The insulated cooler bag collection from Custom Earth Promos is an eco-friendly blend of style and practicality. Made from non-woven polypropylene on the outside and insulated lining on the inside, these bags are strong and durable enough to sustain heavy items for an extended period of time. Your search for a practical and eco-friendly promotional item is over. Custom Earth Promos brings you a collection of insulated coolers that can be customized with imprints of your brand name and logo. Add creative messages and eye-catching designs to help increase your brand exposure! Many emerging companies and start-ups rely on giveaway products to gain more recognition from potential customers. Your customers will be impressed to receive our environmentally-friendly bags, as they'll be sure to reuse these coolers time and time again. 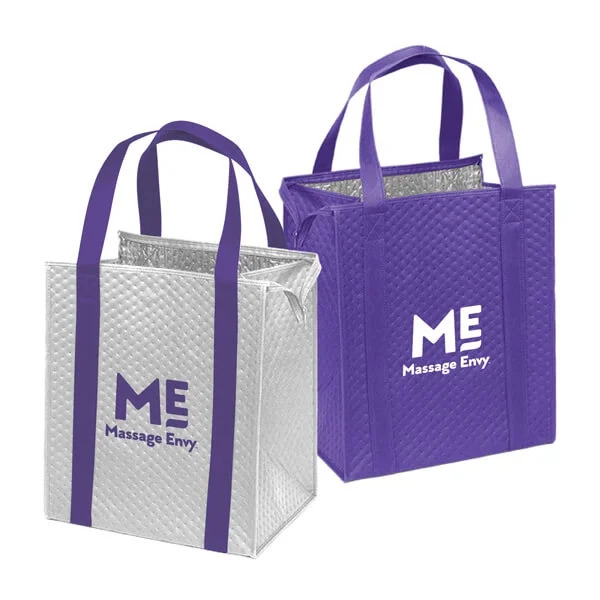 The bags can be used to promote businesses in many industries, such as retail, hospitality, healthcare, education, and more! They can also be used to hand out goodies during trade-shows and company conventions! The material of this bag provides the insulation necessary to keep things cool for a long time. Your customers will find the bags extremely useful for outdoor events, and convenient to clean when they get home. The zippered closure on the bags ensures that the contents will not fall out. The bags are available in a convenient size of 13" W x 15" H, which can be used to carry multiple items at once. The space provided by its 10" gusset can be used to safely accommodate and arrange bulky items. Each bag comes fitted with a pair of 20" long carry handles that can be adjusted for better carrying comfort, as well as a plastic bottom insert for additional support. The available colors are black, royal blue, khaki, hunter green, navy blue, red, lime, brown, orange, teal, brite pink, and grape. We have an extensive collection of pre-designed graphics and stock images that can be used as imprints, or edited to fit your needs. All our products are tested and cleared for contamination from harmful additives that are listed under the California Proposition 65 guidelines. Our custom manufacturing facility ensures that large quantity orders are fulfilled exactly according to client specifications. Highly-trained design experts tend to your order of Wholesale Insulated Cooler Bags and skillfully craft them to produce impressive results. These high-quality products are then provided to you at affordable prices that suit the budget of emerging businesses as well.